L'Oréal Paris Age Perfect Intense Nutrition Rich Repairing Night Cream is an ultra-rich night cream formulated with Manuka honey and calcium B5. It works to restore skin’s density and deeply nourish overnight for ultimate hydration. I used this night cream with the serum and day cream, and saw a definite difference in my skin. First off: the packaging. This packaging was so gorgeous, it made all the products look so luxurious and they looked so nice sitting together on my bathroom cabinet. I've never used a night cream before, and didn't really see the point. A moisturiser is a moisturiser. but using this one made me realize how wrong I was. Obviously if you're not going out for the night you can afford to use something that takes some time to sink in, meaning that if i put it on before bed it can sink in while im sleeping and i can wake up with soft and nourished skin that is ready for the day. My skin is in tip top shape at the moment & i couldn't recommend this night cream highly enough. I found this product really great for more than one reason. 1) Like the whole L’Oreal intense Nutrition range, the night cream box is packaged creatively and is beautifully done. Like the L’Oreal Intense Nutrition serum and the day moisturiser, it would definitely catch the attention of the shopper who might not know the product and would compare it favourably to other merchandise in offer in the aisles. 2) The consistency of the night cream was heavier than the day cream but appropriate for night cream. 4) The product worked really well on my combination dry skin. 5) The night cream had a great texture and so it was easy to apply. 6) my skin felt moisturised right through the night. 7)I would purchase this range very happily. It’s great and I have recommended this to my friends. I trialled the day cream, night cream and serum in the Intense Nutrition range as part of the beautyheaven Trial Team. I spend a lot of time outdoors so it is important that I have good skin care in order to protect and look after my skin in the dry, harsh Australian conditions. Especially now in Summer when most days are 30-40 degrees where I live. The outer box suggest quality product and contains a lot of information. The inner jar has less information but is aesthetically appealing with dark body and gold lid. The fragrance is nice and light and not noticeable when applied. The night cream is luxurious and rejuvenating. I've seen the amazing skin healing properties of Manuka honey on wounds and I think the same principles apply for everyday regeneration of new skin cells. The night cream was long-lasting and moisturised my skin all night, I woke up in the morning and my skin feels very soft. This night cream is fabulous on my skin but once again took getting used to as smell is quite overpowering. Definitely nourishes really well but didn't make me feel it was oily or too rich for my skin. At my are (64) I can now see the necessity for a denser richer cream. I have had no feeling of dryness which I have experienced with other lighter creams. I could still feel the benefit the next morning. Once again I feel packaging too heavy looking and weight wise also heavy. The Age Perfect Intense Nutrition Night Balm comes in a beautiful small gold jar and looks very elegant. It has quite a strong, pleasant scent. After a long day I look forward to cleansing my face and applying a nourishing night cream to work its magic while I sleep. I used the night balm after first applying the serum. I found it very thick and had to really scoop it out. It needed a bit of rubbing into skin and felt slightly oily which didn't bother me just going to bed. It made my skin feel firmer and well nourished. I would only use it on very dry and mature skin as I think it may be too heavy otherwise. Would use the serum first as I think it helps with applying the thicker balm. After not having changed up my night time skin care routine for a while I was excited to try this out as part of the trial team. I applied the night cream after cleansing and toning and found that it did sting a little, but I guess that means it's doing something! The product itself did not feel too heavy on the skin (after a while of massaging it into my skin) so it felt nice on the skin when going to bed as it can be uncomfortable to sleep when your face feels like it's covered in heavy, sticky product. I also have quite dry skin so using the night cream in conjunction with the serum was very hydrating for my skin so I would definitely recommend doing this if you have dry skin like me! I think I will have to continue using these products for a while longer to see some ageing differences however it certainly helped in hydrating and softening my skin. I have been using the Age Perfect Intense Nutrition Rich Repairing Night Cream in conjunction with the matching serum and day cream. On the box the product is described as a rich repairing balm and this sums it up perfectly! The cream is in a lovely brown glass jar with a gold screw top lid which looks and feels much more expensive than it actually is. The cream, or balm, is quite a dark orange in colour which quite surprised me. the fragrance is lovely, not too strong but sweet and almost caramelly! The texture is absolutely wonderful, light but really rich at the same time! It is an absolute pleasure to use! I have been using the cream on cleansed and toned skin on top of the matching serum for a few weeks and I am loving the difference it has made to my skin. The wrinkles are much improved as is the texture and luminosity, my skin is glowing! A little goes a long way, I would recommend using the night cream on top of the matching serum for the best results. Ideal for all mature skin. I have an oily tzone but even though it says it is best for dry skin I have experienced great results. I used the L'Oreal Age Perfect Intense Nutrition Rich Repairing Night Cream in conjunction with the serum. I have tried many expensive night creams before this and not had a lot of luck in finding any moisturiser that would penetrate and soak into my dry and mature skin. As I have matured my skin has become uncomfortably dry, especially in the cooler months so I was pleasantly suprised to find such an affordable yet luxurious rich night cream to fill the void. I used this nightly after cleansing and applying serum. I have also used it without the serum and the effect is similar. It is quite rich so you dont need to use a lot (a jar would probably last over 2 months, maybe even 3). My skin felt soft and I feel like my wrinkles softened after continued use. The smell is quite nice and the packaging is quite luxurious. Dont use too much, just a small amount until you find the amount that is right for you. It is quite rich. Thank you BeautyHeaven and L'Oréal for this trail opportunity. The L'Oréal Paris Age Perfect Intense Nutrition Rich Repairing Balm is an incredibly thick and rich cream for night time use. It is part of a range of products to suit older women to help fight signs of aging and skin stress. The product comes in a jar inside a copper gold coloured cardboard box. The cream itself smells like warm sweet sugar, honey, cinnamon sweetness. It is 50ml of product and you scoop some out to use. The cream is very thick, I mean, v e r y thick. It is called a balm and it feels like a balm. It is so thick that it takes some time to scoop some out and to apply this cream onto my skin. It takes a while to get used to this thick balm and applying it takes a good few minutes because it does not just apply creamy. I have to massage it in. Spend a few minutes applying this night cream gently onto your skin. This night cream is luscious and would suit ladies in their mid years onwards to keep their skin soft and touchable. This cream is specially formulated for the mature and dry skin, like mine is at the moment. This product is part of a three product regime . Then apply the night cream . All the products begin with the serum going onto a clean face . The night cream ccompliments the serum and day cream in a matching dark colour and gold trim in a glass container . The screw cap lid has a wide mouth for easy access of the cream and a small dan of cream goes a very long way . The night cream has a pleasance scent to it and is slightly thicker in texture than the day cream but having said that still gets absorbed readily into the skin . - leaving me with a smooth almost silk like feeling face and throat . After a few weeks of using the product with the other teo products in the range I noticed my skin was not as crinkly and dry as before. My wrinkles even seemed less niticeabke so I am very happy with this product and wil continue to use it as it seems to have delivered everything and more that it promised !!! Great of 60 plus skin typrs !! I received the L'Oreal Age Perfect Intense Nutrition Rich Repairing Night Cream as part of the trial team and sadly this cream is just not suitable for me at all. I tried to use it on several occasions, both with the serum and without but it seriously irritated my eyes almost as soon as I applied the cream to my face. I even gave my eyes a wide clearance and only applied the cream to my forehead, lower cheeks, nose area dn chin as well as the neck and decolletage but had to quickly wash my face again. The cream itself is presented in a golden brown box which contains a square brown glass jar with a gold trim brown plastic lid. The jar has a plastic cap inside to keep the product fresh. The cream is a very thick and rich yellow colour with a slight blossomy scent. As soon as the cream was applied to my skin I could feel the effects and tightening of the area. This was a positive reaction and I was pleased. Sadly for me this was very short lived due to the irritation. I must say that the lower area of my face did appear tighter and well nourished but I could not really give a positive end result as I just had to discontinue using this product for a reasonable period of time to assess any benefits. I have returned to using other L'Oreal age perfect day and night creams without any irritation to my eyes. This cream is a very rich and thick cream so I would suggest applying it sparingly and be careful near the eye area if you have sensitive eyes. Anyone with mature skin to nourish while sleeping, providing you don't have sensitve eyes. I would suggest trying a sample before purchasing. Another great product from Loreal. The Loreal Age Perfect Intense Nutrition Night Cream comes in a nice little glass jar with the gold rim around the top of the lid. Its a good size and I found that in the four weeks I used it I still have plenty left. I applied the night cream after I had applied the Intensive Re-Nourish serum. When I opened the jar straight away I could smell the honey, it was a very pleasant smell for a cream. I found I didnt need to use much as it was very thick. When applying it , it took a long time for it to soak into my skin which was surprising as my skin is very dry. I found my skin felt nice and over the time was looking better and some of my wrinkles were getting fainter. I also noticed that in the morning my face looked and felt alot better than it used to be. It also looked very refreshed. I received this product as part of a trial team. The cream is contained in a square amber glass jar with a gold lid which looks quite lux. The night cream is a pale yellow colour and has a pleasant smell, slightly sweet without being overpowering or sickly, and is not so strongly perfumed as to cause irritation for my sensitive skin. The product is thick and creamy and feels quite luxurious when applied; it's thickness makes it a little difficult to spread easily; I would scoop a small amount out and warm it up between my fingers - this made it easier to spread. This cream was very rich and although it did make my skin feel soft, I think It may be a little rich for nightly use. I also think it would be more suited to slightly more mature skin, or for extra protection during winter. Mature skin, or for extra protection during winter. This 50ml Rich Repairing Night Cream, like the day cream is elegantly packaged in a square shaped glass jar with a gold coloured lid. It also has Manuka Honey as one of its ingredients to help repair the skin barrier function and Calcium B5 to help restore skin density and support skin tone. This product has been specifically formulated for mature, dry skin and is recommended for those aged 60+. It is a yellow coloured cream which is quite thick and I found difficult to apply and also that it didn’t absorb into my skin very well and actually felt like it was clogging my pores. It does have quite a pleasant scent. I have noticed a slight improvement in some of the fine lines on my face. I usually do really like using L’Oreal products, but unfortunately find that I cannot recommend this one, because it is so thick and doesn’t feel good on my skin. Thank you Beauty Heaven and L’Oreal for giving me the opportunity to trial this product. I have to admit I am somewhat slack with my nightly skincare routine throughout my life, sporadic bursts of good intentions go out the window when you've had a long day and just want to fall into bed. With that said I have been consistent with the L'oreal Age Perfect Intense Nutrition Rich Repairing Night Cream, I want to prove to myself that I can dedicate myself to a nightly skincare regime and I am happy to report so far so good. The results have made it worth it. I diligently cleanse and moisturise each night and my skin is reaping the benefits. I am waking with brighter clearer skin! I also made sure I applied it to my décolletage and I have certainly noticed a difference there. The copper packaging is gorgeous as is the brown and gold jar, always a sucker for lovely skin care products! On applying you don't need to use too much as a little goes a long way. It's definitely way more dense than the day cream and feels richer on the skin. I can imagine some people wouldn't like the heavier cream though as a night cream I would expect it. The scent is nice, not overpowering. I love that teaming the night cream with the serum and the day cream it's really made a difference to my skin. It feels smoother and I really think it has improved and lifted my overall appearance. At $36.95 for 50ml I think the Age Perfect Intense Nutrition Rich Repairing Night Cream is a great investment in both your regime and your skin! The Loreal Paris Age Perfect Intense Nutrition Night cream comes in the same elegant packaging as the day cream which is very classy in a square glass amber jar with a gold lid. I initially found it difficult to differentiate from the day cream both being a similar colour (the night cream is slightly darker), with a similar smell and texture so I always check the label before use as it clearly states night cream on the front of the jar. The consistency is rich and wonderfully moisturising for my dry and aging skin. I initially thought it looked thick with a heavy texture but after applying at the end of the day following cleansing and using the accompanying serum, I felt that my skin immediately benefited from this wonderful product. I can’t believe I was actually a little nervous about using it at first as I don’t like heavy, greasy creams but I didn't need to be because it absorbed beautifully and the following morning my skin felt soft and smooth. As the consistency of this cream is quite heavy a little goes a long way so I am sure one jar will last quite a long time. I loved the fragrance which was subtle and light and the good news in my pillow didn't feel all oily in the morning. When used in conjunction with the Day Cream and the serum my skin felt hydrated and smooth. I loved it. To sum it up, I have been applying this cream every night after washing and cleansing my face and applying the matching serum. The product provides good coverage and absorbs very well leaving my skin feeling hydrated, soft and youthful. My skin has felt firmer and smoother during the time I have been using it. I have noticed some tightening and lifting particularly in the neck area. The product claims to restore skin density and support skin tone. It does indeed meet these claims. My skin really feels radiant and looks more healthy and it was noticeable within a few days of starting the product range. This product is quite rich so not a lot is needed to cover the face. I do recommend this product and preferably the three products in the range if you can afford them to aging women with dry damaged skin. The Intense Nutrition Rich Repairing Balm comes packaged in a brown jar. The product appears as a yellow cream which has a very thick consistency. The scent is quite mild (not offensive at all), and is quite floral, it is quite pleasant scent. There is a spatula to scoop out the product. I felt like the product simply sat on top of my skin rather than being absorbed - so not sure what . if anything, this product would do to nourish my skin. As this product sat on my skin I found smears on my pillow the next morning. This did not vary whether I used more or less of the product. 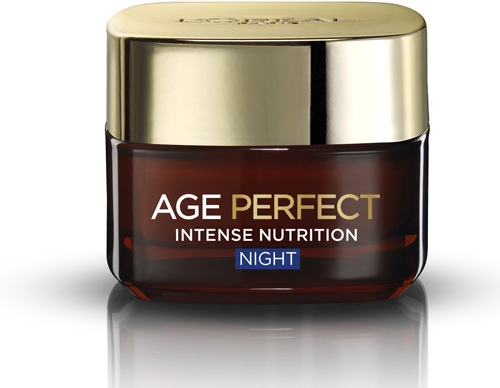 L'Oreal Age Perfect Intense Repairing Night Cream is like a treat for dry skin. I find it too rich to use every night and am happy with results using it once or twice a week to avoid clogging pores. A good night cream when skin needs extra moisturising. Leaves my sensitive skin feeling soft and non-greasy. A great aid in the fight against wrinkles which I will continue as I see the benefits regular use produces. The scent of subtle honey is gentle & soothing & as someone allergic to most perfumes, not at all irritating on my skin. L'Oreal has been my brand of choice for anti-aging moisturisers for many years & this new night cream will join the beauty regime to keep my skin looking fresh & much younger than my years! Rich Repairing Night Cream - which I used in conjunction with the Extraordinary Repairing Serum and the Rich Repairing Cream Day (see separate reviews for these). I like the luxe look of the L'Oreal packaging - I was a bit put off by the AGE 60+ on the box - I'm not 60 and no woman wants to be reminded of her age. That said I like the rich tones of the packaging and the jar of cream is lovely to hold, easy to use and store. Your skin instantly feels the benefit of those 10 essential oils and I do feel that when I woke up each day my skin felt like it had been deeply restored. This product helps to nourish skin with nutrients during sleep with beautiful oils like passionflower oil, rosehip oil, apricot kernel oil, cameline oil, rice bran oil and corn oil. The sleep-enhancing oils include sweet orange oil, camomile oil, marjolaine oil and neroli oil.  I found it very thick and lavish - a little goes a long way and it absorbs quickly. I used it through winter and was really happy with the feel and the results. I do wonder if it will be too heavy for me to use during summer...time will tell I guess. Don't use a lot, you can always add more. I always apply to my décolleté and upper arms, finishing with elbows and hands. I've got good skin but recently my Aunt stopped a conversation to say: "your skin is just beautiful"....made me feel awesome! Skin that is older and needs extra loving. I was very fortunate to be on a Trial Team so I used it with the Serum and Day Cream - I think that helped me get the results I did. Pharmacies, department stores, and variety stores nationwide.